Last Saturday when Dave and I were in San Francisco visiting our friend Andy, the three of us made a pilgrimage north to Petaluma to the Lagunitas Taproom. Dave and Andy had been there once before, but a few years ago when Carla and I were in the neighborhood and dropped in to Lagunitas for a visit, there was only a small bar/tasting room upstairs in the main brewery building. The taproom and patio, open since the middle of 2009, is a vast improvement. 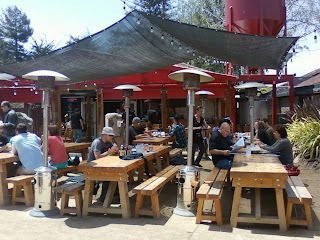 Food, lots of seating, and a good selection of Lagunitas beer. Beer? How about 16 taps of Lagunitas standards and one-offs, plus one or two cask selections. When we were there, one cask was a blend of Wilco Tango Foxtrot and Hop Stoopid aptly named "WTF Stoopid". It had been tapped the previous Thursday, so it was getting a little tired, but I'm a big fan of WTF, so it was nice to try a hoppier, caskier version of it, though it wasn't better than the standard Wilco. WTF bottles say it's an American Strong Ale, and it's a deep brown color, but the flavor says Cascadian Dark Ale to me. Other rarities on tap were Tocaloma Amber on cask, Sonoma Farmhouse Gueuze, a double IPA called Waldo 420, and Fusion VI, which if I remember right is a hoppy ale brewed with some rye. The gueuze is a blend of two vintages of Lagunitas' Farmhouse Saison, and it was really nicely done: tart and funky, but with enough malt heft that even Dave appreciated it. The Fusion was pretty good, but the Waldo was such classic burly Lagunitas that we pondered plunking down the $19 for a growler of it, until we learned that they only serve it for drinking on site. There is also a small gift shop adjoining the pub, which is another step up from the cluttered closet that a receptionist showed Carla and I into a few years ago. All your Lagunitas T-shirt, poster, and blanket needs are available, as well as the excellent custom mason jar pint glasses, marked with a line drawing of the Lagunitas dog logo and whimsical volume lines labeled "3.14...", "420", and "10/6" (ten shillings sixpence -- the price tag that the Mad Hatter left on his hat). Coincidentally, Lagunitas founder Tony Magee is in Portland this week for events at Saraveza (last night, May 11), and East Burn tonight for May's Beer Belly Dinner. I'm kicking myself for not getting seats for the East Burn dinner, those are always a fun time and a great deal, and Lagunitas is high on my list of favorite breweries. Next time you're in the California wine country, or if you're in San Francisco and have time for a day trip out of the city, I highly recommend a stop at the Lagunitas Taproom (closed Mondays and Tuesdays).